While many camera enthusiasts believe digital is the only reasonable way to produce sharp images at an affordable price, a growing number still cling to the idea that 35mm film yields the best picture results. A resurgence of interest in vintage 35mm cameras along with the availability of new models (and a wide spread in price points) offers something for everyone. It’s impossible to list all possibilities in this market. The span of historically great cameras stretches back decades. Classics can be easily available on common sales websites, and others are strictly in the hands of collectors. Surprisingly, many of the vintage cameras once thought of as expensive and ‘top of the line’ are now within a hobbyist’s budget. In general, cameras were selected for this review based on how easy they were to find on accessible buyers’ markets. Models are limited to those using 35mm film (sorry, medium and large format folks – that will have to wait for another article). Not all are strictly comparable, but bear mentioning for their specific qualities. One important criterion is the focusing system. Because of their dual or twin focusing system, rangefinder cameras perform well in places where their lightweight and quiet shutter release are pluses. Single-lens reflex (SLR) cameras use a mirror, making them heavier and noisier, but more flexible in terms of shutter speeds and composition. And then we have disposables – can’t live without them. Given these differences in technology, size and weight become factors in our comparison. Carrying an SLR in your pocket isn’t as easy as a rangefinder, but not all rangefinders are created equal either. Portability is a quality desirable by many of us who no longer like lugging a big camera bag through airport security. Users for 35mm cameras range from the beginner to the professional. Some cameras encourage easy experimentation for the beginner or hobbyist, and others require a professional’s level of understanding about photography. There’s something for everyone here, from point-and-shoot non-photographers to the enthusiast who wants to buy something a little out of their skill range and grow into it. Only two of these cameras come with a fixed-mount lens. Others offer a variable array of the standard add-ons to the original body. For a photographer looking for flexibility, we’ve included this as a criterion. New or used – what’s your preference? Readily available vintage (used) cameras have been included in this comparison because, well, these are simply classics. New models may be based on classic designs and features, or offer new attributes. These newer models may also be available used in some markets. Finally, let’s talk about money. Price ranges for some of the vintage classics are surprising. Likewise, some of the new kids on the block means slapping down some major plastic. What can you spend? This perennial favorite of hobbyists and professionals alike is known for its ease of use, reliability, and dependability. While it’s been decades since its last manufacturing (1984), enough of the original million units still delight photogs around the world at an amazingly reasonable price. 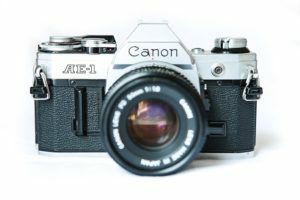 At its introduction to the market in 1976, the Canon AE-1 (Auto Exposure One) offered several innovations to the beginner photographer at a reasonable price. Besides being the first 35mm SLR camera to use a microprocessor, its plastic construction reduced its weight considerably from the traditional metal body. Through-the-lens (TTL) auto exposure metering was also a first. Other SLRs in Canon’s lines at the time used many of the same components, further reducing costs. This camera’s leaps in technology are not surprising, given that its design came at a time when competition between Canon and other brands that appear on this review list reached a new peek. Performance-wise, it’s deemed to be a great buy for beginners and hobbyists, but don’t be surprised to find it in daily use by professionals who never want to be far from capturing that perfect shot. When it comes to pure aesthetics, the visual appeal of the Canon AE-1 is unsurpassed. It looks simple, uncluttered and classy. Easy to fit in the palm sizing and deep engraving on text encourage its use, even after competitive models may be gathering dust in a closet. Mechanical sounds ensure the film has advanced, the shutter released, and dials and levers clicked into place. Features such as shutter priority mode and manual mode give its users a breadth of options to play with. As a manual focus camera, all adjustments are in the hands of the photographer. Its split-prism focusing screen and shutter-priority auto-exposure function produce almost foolproof clarity in its results. Lens costs fall into the affordable range. Their interchangeability was not the norm on a low-priced body at the time. Adding a standard 55mm f/1.2 lens, a wide angle, and a telephoto to the basic body should handle all shooting situations the typical hobbyist finds themselves in. This camera operates on drugstore-available batteries, an unusual advancement for its time. This focus on electronic operations for shutter release and other functions also created a dependency on battery life. Some people feel the batteries last a long time, and other say they are short-lived. Reports of the battery door breaking frequently, along with various complaints about mechanical and shutter wear and tear past what many expected highlight issues about the physical system. The use of plastic parts may be a plus for lightweight but end up creating problems with fragility. Parts for repairs are sometimes difficult to find. Light metering can be a challenge with the AE-1, due to a lack of exposure indicators and only a single pointer needle for the light meter recommended f-stop. While this might not make a professional skip a beat, the amateur user can find this cumbersome. This is a general complaint about the system, that it makes some tasks difficult with too many options while others don’t offer enough. The camera has no aperture-priority mode, making depth of field creative photography impossible. It lacks a program mode as well, meaning the user will need to know how shutter speed impacts shot results. A later Canon model, the AE-1 Program, includes this feature. Overall, taking quality shots with the Canon AE-1 requires thought. This is not a camera for the photographer wanting to shoot quickly and move on, but works for those of us who want to return to the basics of the craft. The pleasure is in using it, quirky issues and all, and finding that you want to shoot even more. The Pentax K1000 arrived on the scene among a flurry of spirited new cameras in the mid-1970’s. Its fully mechanical features (other than a small battery to run the light meter) set it apart in the field of SLRs of its two-decade era. The metal body and parts make it a durable workhorse still widely in use today. Taking a fresh approach to changes in the SLR field, Pentax went back to basics with the K1000. From its manual-only mode to its simplicity of controls, it’s a great camera for the beginner while offering fun for the enthusiast looking for a creative challenge. This 35mm camera has three simple shooting settings – aperture, shutter speed, and focus. For the purist who wants to keep shooting while those with automated everything are waiting for a picture to be saved, it’s heaven. Durability is a given, and as over three million units were manufactured, finding one to buy is not difficult. Options for quality lenses readily available on the resale market for vintage analog cameras make this a favorite across the skills board. In addition to the K bayonet mount line, it works with two autofocus models, K-AF and K-AF2 using manual focus, and accepts other lenses but with limited functionality. The depth of glass options guarantees this will continue to be a favorite into the future. If you’re looking for a great beginner’s camera, one to learn about the ins and outs of photography, the Pentax K1000 features the ability to help you learn quickly. The camera cues you on settings and helps you make decisions to take clear, well-lit pictures. Many photography teachers recommend or require this camera for their classes because of its ease of use. This is the camera for traditional manual photography. While many people love that fact, others are scared away from the creative pressures this brings. 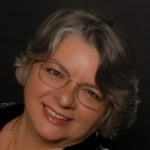 Nothing fancy can screw up your photos, and that reliability can translate into photos as you intended them to be seen. From a size and weight perspective, this camera body fits in the hand, even though it can feel chunky. Its mechanical sounds are not overly loud but establish its functionality. That classic camera look will draw the attention of other photo bugs, even those with fancy DLSRs. With the need to learn how to use a fully manual piece of equipment, the Pentax K1000 requires commitment to the craft. It is a budget camera, without functions such as a self-timer, information in the viewfinder, and rapid light meter. It forces someone to learn photographic skills and technology to be successful. Production of this camera moved from Japan to Hong Kong to China over the years, and because of this, workmanship varies widely. The earlier the production date, the better. Though, it is sometimes difficult to determine where or when your camera was manufactured just by looking at it. Controls on some models may be tight, like the shutter speed dial. Location of controls may require you to drop the camera from your eye, taking you out of the shooting experience. That, coupled with its chunkiness, can turn taking those shots into a mini-workout. The Pentax K1000 is a back to basics kind of machine. It’s made for photography, if not necessarily to make things easier on the photographer. But then, isn’t that what art is all about? Another of the unrelated siblings during the competitive heyday of new 35mm SLR advancements of the late 1970’s and early 1980’s, the Minolta X-700 made a name for itself as a top-grade manual camera in an increasingly crowded market. In the two decades it was made, it stood out because of its multiple auto exposure modes, TTL flash metering and bright viewfinder. Its plastic body construction proved that lightweight did not equate to low quality. The Minolta X-700 was designed to compete in the growing consumer marketplace at a time when everyone had jumped into that pool. It was a combination of the best (and sometimes not so great) mechanics and features of earlier or more expensive Minoltas. It was the last manual focus camera Minolta made before moving into the autofocus it is known for today. The X-700 uses the myriad accessories of other Minolta Program System products, making it generally easier to acquire add-ons. These become important at the edges of the photography spectrum, such as long expose work and rapid-fire situations. The Minolta X-700 offers program auto exposure, aperture priority and full manual modes, making it a great camera for the beginner who wants a range of options. Its viewfinder is something everyone raves about. For the user who sometimes wants the ease of a point-and-shoot and at other times wants to experiment with variable settings, it hits the right midpoint. The viewfinder is large and bright and offers setting indicators in all modes you’d require except full manual. As a consumer level camera, it is easy to use, if all features are in full working order and batteries hold an adequate charge. It uses standard camera batteries readily available on the market. In fully manual mode, the photographer must take their eye off the viewfinder to see the shutter speed setting and compare it to the reading in the viewfinder. If a recommended shutter speed falls between two speed settings, both will light up, and you’ll have to select the one you believe is best. Other awkwardness comes from the locking mechanism for auto and program modes, requiring two fingers to make a change. Over the years since its original production, Minolta changed the production of some internal parts to materials other than the original titanium. Wear and tear on those cheaper parts means more breakage and replacement. 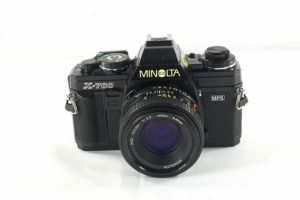 Further research and development in this line was discontinued as Minolta introduced new lines, and the camera was no longer produced after 1999, making finding parts sometimes difficult. Committing to the Minolta X-700 means committing to everything that’s offered with it, from lenses to flashes, motor drives and other equipment. For the hobbyist who owns other Minolta cameras, it’s a great addition to the collection. Known for its quality packed into a compact size, the Olympus OM-1 is often labeled “the Leica for the working class.” Consider this a professional-grade 35mm SLR camera that works well for beginners, too. It is compact and lightweight, with a quiet shutter reminiscent of a rangefinder, while offering so much more. 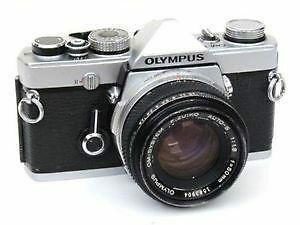 The Olympus OM-1 began its run in 1972, and models updated through the OM-4 over the next thirty years. The mirror-lock feature of the OM-1 made it particularly well-loved by those doing photography requiring extended exposures at night. Its reduction in size, weight and noise over other 35mm SLRs made it a go-to camera for beginners through professionals. Originally, these cameras were known as the M-1. However, Leica owned the M series and objected to the labeling, and Olympus changed it to OM-1. About 52,000 units of the M-1 were made, making them collector’s gold. From an operating perspective, there’s no difference between those early models and the OM-1. Users rave about the stand-out differences of the Olympus OM-1, like the shutter speed dial on the lens mount, allowing you to keep your eye on the camera between shots instead of fiddling with a top plate dial. The through-the-lens (TTL) exposure meter indicator is a needle visible in the viewfinder, another streamlined shooting feature. The camera is fully mechanical, so dependency on the light meter battery is not an issue. The OM mount lenses made by Zuiko outperform many other brands on the market. Lenses across the spectrum from prime and macro to zooms, and other accessories are readily available at reasonable prices. One final point is the ergonomics of the compact body. Photographers report their hands automatically fall into place on this uncomplicated design, with easy identification of controls without shooting interruptions. The large viewfinder adds to ease of use. The lack of automation and simplicity of this model translate into no display information in the viewfinder. This means the photographer must lower the camera from the eye to check settings. The lack of an auto exposure mode can be challenging to beginners learning what photography’s all about. The light meter is set to run on a discontinued battery. While hearing aid batteries can work, they lose voltage over time and the meter becomes unreliable. When sending the camera in for a cleaning, lubrication and adjustment (CLA), ask your repair shop to set the camera to use 1.5-volt batteries generally available on the market. Film loading may be tricky for those trying to move fast. Properly loaded, the film lever advances smoothly, but if the rewind lever sticks, it’s an indication the film isn’t loaded right. This can result in the film not winding back into the canister correctly. Many people consider it a shame the OM-1 was only made for eleven years, even though later models in the series offered solid improvements. Used models can have issues, but most can be repaired if you run across one of those lemons. As an introduction or reintroduction to 35mm, this may become your favorite daily accessory. This 35mm film camera is available new today, but performs with the same old gem features the F series is known for. From its weight to its operations, the Nikon F6 satisfies professionals with its robust durability and high-grade lenses. Its price tag isn’t for the shy, but then again, neither are its capabilities. The Nikon F6 comes from a long line of 35mm SLRs that some said had run its course. Improvements in this model when it was released in 2004 accentuated notable features of the line and returned the series to its professional grade. Exposure options include everything the professional needs, from program, shutter priority and aperture priority through manual. It offers automatic film loading and auto or manual film advancement, saving the user valuable time during a shoot. This iconic camera can be fast – with an electronic shutter speed up to 1/8000th of a second. It can be dizzying, with so many setting options that it might take a decade to learn them all. Its rugged design with metal, Kevlar and aluminum takes whatever the professional dishes out. For the professional who is a Nikon fanatic, this will be the film camera in use when the digital just won’t do. A manual lens can make shooting special, as can the use of flash settings. The Nikon F6 is better than its predecessors in all the best ways. 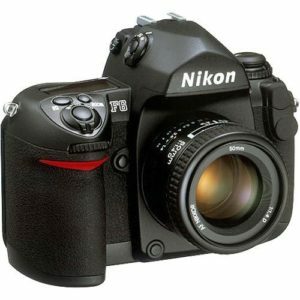 In a sense, the F6 took the best of Nikon’s digital workmanship and added features like the body and grip to the SLR model. The monochrome LCD screen conveniently captures the settings and readings just below the viewfinder. Indicators inside the viewfinder are larger and crisper, making them easier to see. This electronics-powered system runs on standard CR123A batteries, reducing the weight formerly added by eight AA batteries. The 11-zone autofocus improves focusing clarity. One of the major improvements over previous models was better ergonomics and reduced shake and noise during use, other factors contributing to quality results. It may be hard for some people to get used to the dial and button placement, because some of these have been moved from earlier models (and from the F6’s digital sibling). Most notably, the FUNC button now needs to be run with the fingers on the left hand as most people cradle the lens. Since the weight has not been measurably reduced, prepare to twitch a little at first. The LCD may be difficult to read in low light situations. Also, the hierarchy of the menu system is not intuitive, and searching for what you need in the matrix can waste time. Overall, the camera requires a longer learning curve to become comfortable with its many features and settings. Because it offers so many capabilities and options, the Nikon F6 is an energy hog. Plan to carry a bulk pack of extra batteries on longer shoots, or buy the optional vertical grip and rechargeable battery instead. Even with this issue in mind, the F6 is a professional’s go-to model when digital won’t make the images special. Touted by photojournalists all over the world because of its workhorse nature, the Nikon FM2 is considered by many to be the ideal 35mm film camera. Flexibility in lenses, as it’s compatible with every Nikon F-mount lens ever made, add to its appeal. Nikon kept the ‘bloat’ to a minimum on this model. In the range of market options for 35mm SLRs, the Nikon FM2 falls squarely in the middle. It’s great for the hobbyist looking to improve their work to a pro level, while offering an affordable price point and the ease of use flexibility beginners seek. Manufactured from 1982 to 2001, it is readily available on the vintage used market. The Nikon FM2 doesn’t need a battery for its mechanics to work. Combine its incredible shutter speed as fast as 1/4000th of a second with accurate metering and a mechanical shutter, and you understand why this is a favorite of professionals who want a film option as a fallback when all other batteries have died. The compact design of the Nikon FM2 doesn’t shortchange its quality craftsmanship and reliable durability. It is operable without batteries, being a mechanically-controlled manual focus SLR. Light meter batteries are readily available. 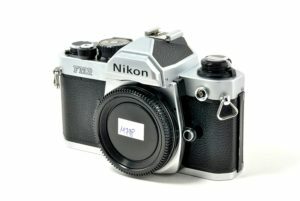 Nikon has continued the FM tradition with today’s model, the FM 10, making the Nikon FM2 easy to find parts for, simple to repair, and a breeze to match with lenses. The array of F series bayonet mount lenses and other Nikon options means there are choices out there no matter what your budget. Other accessories include a motor drive, data back for date and time stamping, and variable electronic flashes. Perhaps the best feature of the FM2 is its utility. It doesn’t have many of the capabilities of other vintage cameras, and yet, those often aren’t necessary to quality photography. Using the FM2 makes photography more about the shooting and less about fiddling with the camera. This is a camera for the user who understands aperture settings and shutter speeds and doesn’t mind paying a little more for durable construction. It has a simple light meter and a mechanical shutter, but no autofocus or auto-winding. The lack of complexity can frustrate those unwilling to take the time to learn what photography is all about. Shutter noise is part of this shooting experience. The titanium shutter is also reported to fail frequently, and replacement with an aluminum shutter is the only (but beneficial) option. Still, the overall reliability outweighs these issues in most enthusiasts’ minds. For the beginner who wants to start off with a camera to grow into, the Nikon FM2 is a great choice. It makes a great backup camera or a multiuse system for the professional. Most of all, it’s pure uncomplicated fun for any enthusiast. It’s a workhorse, though it won’t be the only camera in your bag if you want flexibility in your shooting style. The Canonet G-III QL17 was manufactured by Canon for ten years beginning in 1972, producing over 1.2 million units. It is perhaps the best-selling 35mm rangefinder of all time, and for good reasons. Size and weight: 1.37 lbs. A fixed mount lens made this camera stand out in a field that included spendier brands and less expensive ones with greater flexibility. That didn’t stop the Canonet G-III QL17 from being considered a direct competitor to all. This baby shines for street photography, and invites you to carry it everywhere to catch those impromptu fast shots. The Canonet boasts full manual control as well as a shutter priority auto mode. While this was common on much more expensive cameras, it’s one of the many features standard on this affordable rangefinder. Reliability and great performance are consistent across all Canonet models, regardless of the black or chrome body or the specific model. It’s all in the name. The original model was the QL17, the QL meaning a quick film loading system that’s fun to use and the 17 referring to the f/1.7 lens reported to be as sharp as Leica’s. Canon denoted the G for ‘grade up’, adding improvements over that original model, and III is the third generation of those quality enhancements. 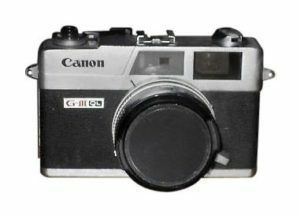 This was the last Canonet model made. Another feature that draws enthusiasts to this model is the fact that it is a rangefinder, and arguably the best made (sorry, Leica). It needs no battery, has a firm, weighty feel in the hand, and is constructed in a way that encourages durability. The photos it shoots are precise and clear. The lens is part of the reason why. The science behind lens construction says the closest to what-you-see-is-what-you-get occurs at 42mm. With a fixed mount lens of 40mm, the Canonet outperforms more expensive interchangeable models. As the only fixed mount lens camera on our list, you can expect that one of the complaints about it is its lack of flexibility across shooting situations. Most users learn to adapt, because that’s not the reason they buy this baby. Another issue is the perennially inaccurate light meters. This could be due to the battery indicator light, which is notorious for breaking easily, but that can be overcome by using external light metering. Using a cap to block light entering the lens extends the battery’s life – and no, it’s not a modern battery, so bear that in mind too. There are few detractors and many enthusiasts for this Canonet. Despite its fixed focal length limitations, it produces the photo you see in your mind when you look through the viewfinder. At a very reasonable price well under the cost of a nice dinner, it’s a terrific addition to any hobbyist’s camera collection. 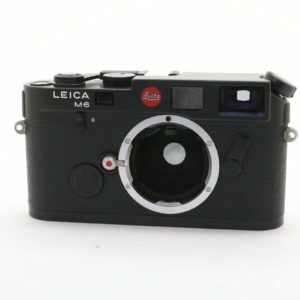 It’s impossible to hear the name Leica without thinking of the many legendary photographers who valued this iconic brand, and specifically, this camera. 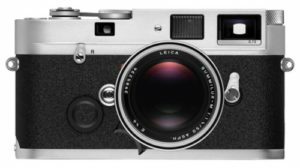 The Leica M6 was the first 35mm rangefinder in its class to offer classic design, compactness, and shutters that whispered instead of roared. That kind of quality didn’t come cheaply then, and it still doesn’t today. Note: If you’re looking for something more on the budget-end of the spectrum, check out Photophique’s look at top film cameras for less than $100. Credit the rangefinder technology, or its precise design and high-quality manufacturing. The Leica M6, while far from the least expensive of the vintage cameras on our list, still makes the hearts of photographers worldwide pound hard in anticipation. This is a machine for the serious enthusiast or the seasoned professional. The price tag on this body is indicative of both its bulletproof quality, and its popularity among serious users. It is also easy to use by the beginner committed to learning about photography and prepared to move up in skills at a rapid pace. It was produced in limited quantities and special editions from 1984 to 1998, adding to its cache among fans. The M6 was the most advanced rangefinder made by Leica and is considered superb by any Leica lover (and some detractors, too). The quietness of its operations makes for unobtrusive photography, the kind many professionals prefer when they’re shooting in settings where a noisy click and release would otherwise be an insult. Its competition comes from newer electronic Leica models, but when it comes to manual, this is their superstar. It’s hard to find complaints when faced with perfection. Personal preferences were mentioned, but those were less about the camera and more about how someone wanted to use it. And, well… price. It is a Leica, after all. With photojournalism in its heritage, the Leica MP 35mm film camera is an all-manual classic that only needs a small battery to run is metering system. This rangefinder has a fast shutter, a comforting all-metal body, and availability of a selection of lenses to keep you amused. Its price, maybe not-so-much. The ‘MP’ in the Leica MP name stands for ‘mechanical perfection’, and perhaps it is. It bears many retro design elements to take the enthusiast or professional back to the days (beginning in 2003) when form followed function. Metal controls and bottom-loading film support the sturdy construction and reliability. The all-mechanical Leica MP feels like a precision instrument, designed for its purpose without useless or meaningless features. From the sophisticated click of the shutter to the uncluttered controls, it is a 35mm camera-nerd’s camera. It has everything necessary – shutter and shutter speed dial, lens, aperture control, and film advancement – with none of the distracting extras. Within reason, certain features of this camera are customizable from the factory. Add-ons like motors and winders work well with the system. The depth of M-mount lenses makes almost any kind of photography achievable. Because the MP is a keep-it-simple camera, some potential users may be turned off by the manual-only focus and exposure. The TTL light meter is simple but effective, producing shots consistent with conditions. It uses a variety of film types with good quality across the range. The price tag will make many buyers gulp. Know that while many other brands of lenses can work with the MP, it’s best shot with a Leica lens, so… double-gulp. This is THE film camera of a lifetime, and a major investment at the same time. While this camera is arguably the ‘ultimate’, it’s also not within the affordability range of most photogs. It is not for the casual user. Save up for this one after learning the how-to’s on lower price range cameras – and when you earn this one, you’ll appreciate it even more. There’s nothing fancy about a disposable camera. Point, click, send it in for development. The few enhancements offered in this market are waterproof models (for those amazing snorkeling shots), flashes, and modifications to the plastic or cardboard bodies to match color themes. Still, they serve a purpose in the 35mm film camera market. Size and weight: .31 lbs. 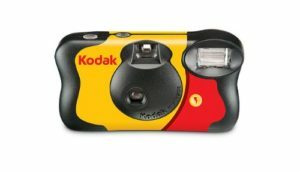 There are no technical features to speak of on these disposable cameras. Grab and go, point and click, and no technology choices to make – like most popular instant cameras, they won’t frighten off the novice. Today, we most often see these cameras at drugstore counters or vacation destinations, and they pop up at weddings where guests are encouraged to shoot the event through their perspectives. It shouldn’t be surprising that the best disposable models are made by the same companies that make the 35mm film, Kodak and Fuji. These are no longer your parents’ cheap knock-offs. They even come in film speed choices to meet an array of photo needs. The Kodak Fun Saver is judged to have the overall best performance. It’s also the least expensive, though we’re talking pennies here. It shoots well in open sunlight to very low light photography situations with 800 ISO color film. The slight graininess of the image, common to all disposables, is not as pronounced – despite the plastic lens. Fujifilm Quick Snap is the easiest to use. The flash has an always-on option, so even borderline light situations can appear better lit. Its 400 ISO film tends to work best in landscape and daylight settings. Yes, it’s disposable. Yes, after you send it in for development, you have no equipment to hang on to. Once you’ve shot the roll inside, you have nothing to move on to. BUT – it fills a space in an otherwise more serious hobby market. Because there are no adjustments to make, the conditions you shoot under will be what you see in the developed roll. Shooting from too close to an object or in conditions where lighting isn’t optimal will result in blurred photos. Graininess in the shots and the sometimes-weird colorations (like magenta in skin tones) can’t be avoided. It’s hard to rank disposables side by side with the other cameras on this list, and yet, there’s a certain artistic flair to what they can do. From community documentary projects to emergency accident photos, wedding reception craziness to facing down a fish underwater, they fill a need. Why else would they still be popular after 65 years?